In a large skillet, heat 1 tablespoon of the oil over medium heat until the oil is rippling and hot. Cook half of the beef until it is well browned on each side, about 4 minutes. No need to cook it all the way through – just get some great brown color all around. (you may need to add another tablespoon of oil to the pan if it looks a little dry). Remove the meat to the slow cooker, trying to keep as much oil in the pan as possible. onions are translucent and golden, about 6 minutes. Add the tomato paste and cook, stirring, for about 2 minutes. Slowly whisk in the broth, soy sauce, ½ teaspoon thyme and bay leaves. Bring the mixture to a boil and transfer it to the slow cooker, pouring it over the meat. teaspoon salt and ½ teaspoon pepper. on top of each other if you don’t have heavy-duty). Place the tossed vegetables on one side of the foil. will fit in the top of your slow cooker. Stir the tapioca into the slow cooker. for 6-7 hours or low for 10-11 hours. When the stew is finished cooking, carefully remove the foil packet from the top of the stew. Discard the bay leaves from the stew. Carefully open the foil packet (be careful of steam that may escape as you open it!). 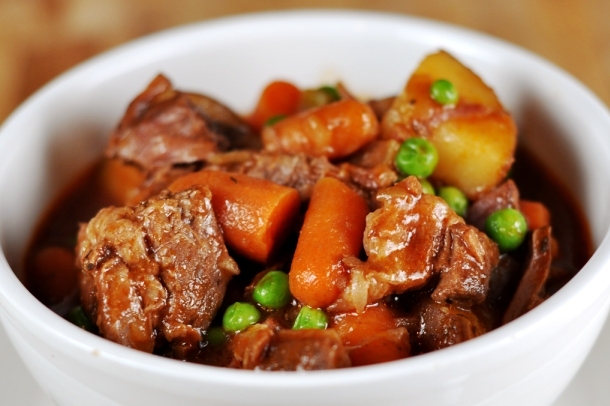 Return the vegetables and any juices to the slow cooker and gently mix them into the stew.